The Islamic Circle of North America (ICNA) is rather proud of its involvement with Toyota's recent Super Bowl commercial. 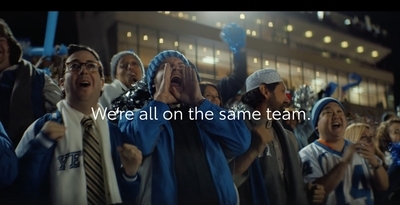 Writing on Facebook, ICNA's Council for Social Justice team expresses its "appreciation for the opportunity to work with Toyota USA for their Super Bowl commercial entitled 'One Team' and provide consultation. ... CSJ was involved in the production of the commercial including script writing, scouting for locations, talent search, filming and editing." The commercial features a rabbi, pastor, imam and a monk all attending a football together, ending with the line: "We're all on the same team." Nothing wrong with that. But if you've read Islamist Watch's recent articles, you'll know that ICNA is not a champion of interfaith dialogue, but a hardline Islamist organization tied to terror abroad and deep-seated bigotries at home. ICNA CSJ is one of ICNA's many sub-groups. A brief look at its own officials reveals an organization deeply at odds with Toyota's Super Bowl message. 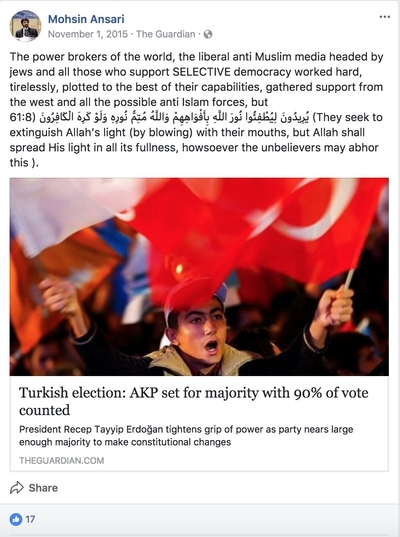 Board member Mohsin Ansari, for example, expresses praise for convicted war criminals and states his pleasure that the Islamist party in Turkey is in power despite the "power brokers of the world, the liberal anti Muslim media headed by Jews." Other key officials at ICNA CSJ include Director of Communications, Rameez Abid, who shares articles on social media that denounce the "gay agenda" and refer to homosexuals as "kufr" [a derogatory term for non-believers]. And ICNA CSJ's Executive Director, Zahid Bukhari openly promotes Jamaat-e-Islami (a violent South Asian Islamist movement to which ICNA belongs) on his Facebook page, as well as petitions in support of Jamil Abdullah Al-Amin, an Islamist who murdered a police officer in Georgia. ICNA CSJ's official Facebook page echoes this extremism. Previous posts have included expressions of support for Senior Al Qaeda Leader Muhammad Rahim and the convicted terrorist Aafia Siddiqui. When Siddiqui was arrested, she was found in possession of instructions for making bombs, descriptions of New York City targets, and two pounds of sodium cyanide. During her trial, Siddiqui demanded that Jews should be excluded from the Jury. This isn't the first time ICNA has been involved with a prominent commercial. Last year, it helped Amazon with a very similar concept. It is welcome news that prominent corporations are working to promote interfaith dialogue. But to be most effective, perhaps it would be better if they chose an organization that doesn't incite hatred and excuse violence against other minorities?